Here is what she looked like with a "blacked out" '74 grille. I changed it because I prefer the look, plus the appx 15 pound weight reduction is a big bonus. When I got it (from another member) the grille shell was primered. Since painted wasn't the look I was going for, I stripped it down to find a typical ratty looking anodized finish. I spent a great deal of time stripping the coating down to the bare aluminum so that it could be polished. Now it shines like chrome. I also resprayed the grille itself as it was flat black, and I prefer semigloss. The only thing I am a little bummed about is my original emblems don't fit. another view. Hopefully this year the hood will get painted, and I will paint those bumper fillers the proper blue also. Can the 74 grill be stripped and polished like that too? 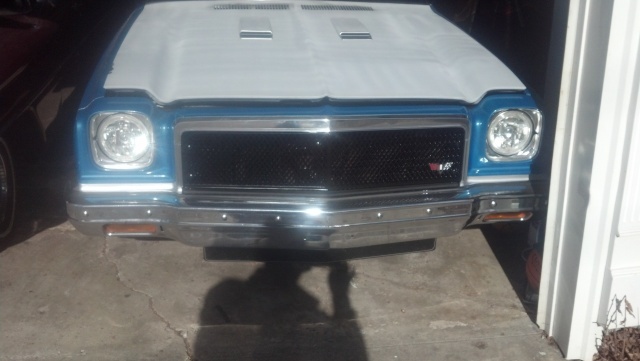 driveit wrote: Can the 74 grill be stripped and polished like that too? No, the '74 grille is chrome plated pot metal. The '76/'77 is anodized aluminum. I like where you put one of the G3GM sticker good spot for shows and Such !! Thanks, It looks cool between the msd box and the air cleaner. Go ahead and ship that your 74 grill to me and your design is free. lol. I like that 74 grill. John, I have a Bow-tie that will fit the front but the "Inset" is missing it was gold but was cracked bad when I got it. I'll send it to ya (gratis). I was going to cast it back with JB weld & then scuff/paint the inset but never got around to it...I know it's here sumwherz. The 76/77 "Malibu Classic" piece goes in the lower drivers corner. If I were you I'd make that Chevelle badge fit. You can do it. The grizzle looks good on your car! Well thank you Paul, I appreciate that. I may be putting a different emblem in place of the chevelle emblem. I'll send you a pic when I find it. I'm pretty sure I know where it is. 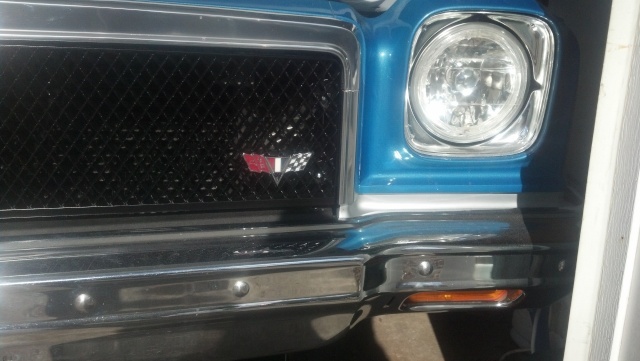 I'm using a '77 grille in my '75 Elco. The outer trim piece isn't in very good shape though. I'll be looking for a better one. This one has a few dings in it. I have the center section painted semi-flat black. I used the '77 grille to save weight on the front end, which is already heavy enough with the Caddy engine in there. 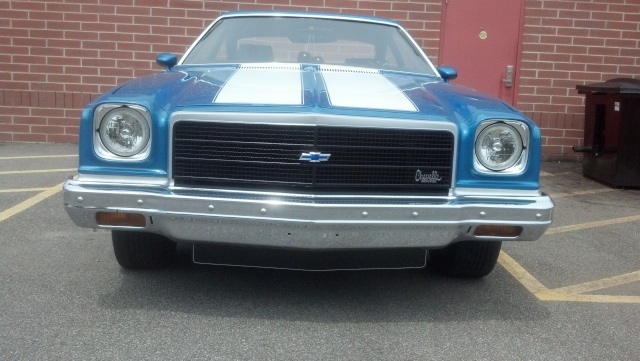 My '74 Malibu has the original die-cast grille, which could us a re-chrome, but not sure who would do it. dynchel wrote: Well thank you Paul, I appreciate that. I may be putting a different emblem in place of the chevelle emblem. How are you prepping the little holes in the center of the grille to be painted? and how well is it sticking? 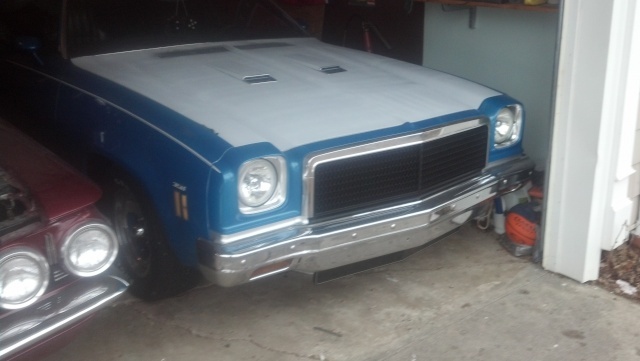 I really want to paint the grille in my 73 Monte, I love the black center look! JiMi_DRiX wrote: How are you prepping the little holes in the center of the grille to be painted? and how well is it sticking? 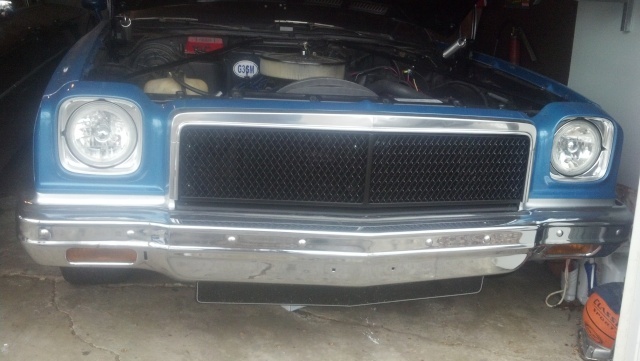 I really want to paint the grille in my 73 Monte, I love the black center look! The '76 grille is plastic. All it took was a good cleaning, a light scuffing and a few costs of satin black paint for plastic. The potmetal one in the top pic should be the same as yours. For that one I had it sandblasted to remove the chrome, primered it and painted the black ((inside and out). When it dried I masked the black to spray the aluminum silver. I used ceramic engine paint for this and it seemed to hold up pretty well to rock chips. BTW I believe I used duplicolor products. I have a '64/'67 Crossed flag emblem I was thinking of modifying to work, but idk if it would look cheesy. Sure I'll take you up on that. Let me Get a pic for the Crossed flag emblem to see if you Like it. that be the one. I'm working on it right now, I'll post a pic when its mounted. Well what do you think? I think it looks kind of cool w/o false advertising. (like putting a fake SS emblem on) BTW, I had to replace the studs and make a backing plate (aluminum of course) to make this work since it was meant to be bolted to a fender. The original application was v8 equipped chevelles, impalas, corvettes, etc from model years '64/'67. opinions...yay or gay. It looks good to me, but I didn't hate the old one. I'd be curious as to how the emblem would look in the center. Well I like it but centered in the other Pics I posted more, Kinda throw's the front end look off by being on the side. But its your ride if you like it there That's all that matters. I can't put it in the center because the grille has a pretty sharp V shape in the middle, and the emblem was for fender mounting. I may put the bowtie back in the center. A '73 must have a way less sharp bend in the middle. thatfnthing wrote: It looks good to me, but I didn't hate the old one. I'd be curious as to how the emblem would look in the center. my original grille had crappy chrome, the first one I pictured (a replacement) looked ok, but the top portion was silver paint...Didn't like that all that much. At least the frame on this one is aluminum an can be polished, probably once a year along with the wheels. In my humble opinion it looks good (nice work on fitment) but maybe just a bit small compared to the "Chevelle" emblem. Didn't those badges come w/ an engine designation number like "350" in addition to having the corvette flags? Just a thought but- if you like it like it as is, that's all that matters, right?